Rockchip RK3368 TV boxes looked promising at the end of the summer, but ended up being disappointing, not because of their expected lower performance compared to RK3288, but simply because they could not deliver on their main selling point: 4K H.265 / H.264 video playback, and the sheer number of issues with the first devices selling for nearly the same price as equivalent Rockchip RK3288 devices. Rockchip RK3368 will soon have a worthy competitor with Amlogic S905, which won’t deliver amazing benchmark scores, but looks promising for its 4K 10-bit HEVC video playback, HDMI 2.0 and HDCP 2.2, and historically Amlogic delivers better video playback than Rockchip. The first Amlogic S905 TV boxes should start shipping by the end of the month, and prices are starting very low, just over $40, thanks to competition between the many manufacturers launching devices based on the new Amlogic SoC. Beelink MINI MX – TV box with 1GB RAM, 8 GB flash, Gigabit Ethernet, Wi-Fi 802.11 b/g/n and Bluetooth, 2x USB 2.0 host ports, and HDMI 2.0. Price: $42.99. Eny EM95 -> TV box with 1 or 2GB RAM, 8 or 16 GB flash, Fast or Gigabit Ethernet, Wi-Fi 802.11 b/g/n and Bluetooth 4.0, 3x USB 2.0 host ports, and HDMI 2.0 and AV output. Price: $56.99 with 1GB/8GB configuration. Venz K1 Plus – TV box with 1 GB RAM, 8 GB flash, Fast Ethernet, Wi-Fi 802.11 b/g/n, 4x USB 2.0 host ports, and HDMI 2.0 and AV outputs. Price: $42.99. 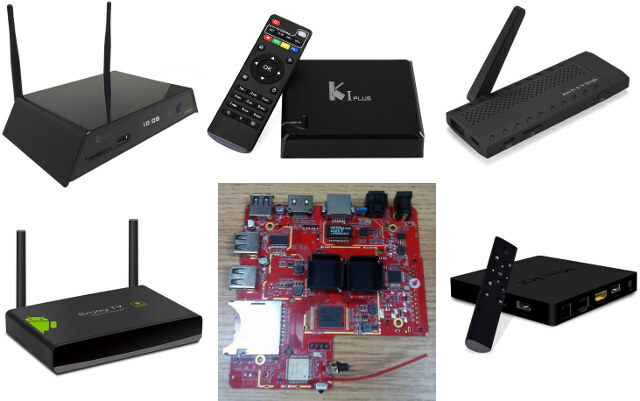 Venz K1 Plus Hybrid is another version with DVB-S2, DVB-T2, ISDB-T, DTMB, or ATSC tuner. MXQ Plus – TV box with 1 GB RAM, 8 GB flash, Fast Ethernet, Wi-Fi 802.11 b/g/n, a few USB 2.0 host ports, and HDMI 2.0 and AV outputs. Price: TBD. Venz K5 – TV box with 2 GB RAM, 8 GB flash, Gigabit Ethernet, dual band Wi-Fi 802.11 b/g/n, a few USB 2.0 host ports, and HDMI 2.0. Price: TBD. MXV Plus (MXV+) – TV box with 1 GB RAM, 8 GB flash, Ethernet, Wi-Fi 802.11 b/g/n and Bluetooth 4.0, 3x USB 2.0 host ports, and HDMI 2.0. Price: $62.99. Xiaomi 3 Mi Box – TV box with 1 GB RAM, 4 GB flash, Wi-Fi 802.11 b/g/n/ac and Bluetooth 4.1, 1x USB 2.0 host port, and HDMI 2.0 and AV ports. Price: $71.79. Please note: Chinese interface only! Eweat M8V – TV box with 1 or 2 GB RAM, 8 or 16 GB flash, Gigabit Ethernet, dual band Wi-Fi 802.11 b/g/n and Bluetooth 4.0, 3x USB 2.0 host ports, and HDMI 2.0 & AV ports. Price: $78.78. Measy B4TS – TV box with 1 GB RAM, 8 GB flash, Gigabit Ethernet, Wi-Fi 802.11 b/g/n and Bluetooth 4.0, 3x USB 2.0 host ports, and HDMI 2.0. Price: $66.29. Quintex S905 – TV box with 1 GB RAM, 8 GB flash, Fast Ethernet, Wi-Fi 802.11 b/g/n and optional Bluetooth 4.0, 2x USB 2.0 host ports, and HDMI 2.0 and AV output ports. Price: $78. M9+ (M9 Plus) – TV box with 1 GB RAM, 8 GB flash, Fast Ethernet, Wi-Fi 802.11 b/g/n and Bluetooth 4.0, 4x USB 2.0 host ports, and HDMI 2.0 and AV output ports. Price: $54.99. Most of the devices come with 1GB RAM and 8GB flash, and price disparity is rather large. In this category the best values appear to be Beelink MINI MX and K1 Plus TV boxes at $43 both. The only TV stick, Guleek U8, is not for sale yet. Two TV boxes stand out in terms of specifications with 2GB RAM, 16GB flash, Gigabit Ethernet, and 802.11ac, namely Ugoos AM1 and Geniatech ATV1950, with the latter also including a dual tuner, but they are not for sale yet. But from this list none of this companies are licensed for HDCP so there is no point of having HDCP 2.2 capable HW when no HDCP key loaded on it? No DRM…. Do you know if there are trustable brands among them ? Buiyng 1GB of RAM devices in 2016 makes no sense to me, better spend 20$-30$ extra and get something with 2GB of RAM. Also with prices of RK3288 going down and Lollipop arriving on it, it is still the best option if you don’t mind spending 20$ extra on top of an Amlogic 905 device or Rockchip RK3368 device. The big problem that RK3288 has and always had is that it micro stutters when playing movies or streaming content from internet and in some cases it can be quite annoying. Also even though the chip is almost 2 years old I haven’t yet seen a fix for the micro stutters yet, and apparently all RK3288 have this problem. wow~~ ZIDOO S905 product coming soon. Thanks for the list! 🙂 cannot locate some of them in the wild though.. like Quintex. is it a sticker brand? Beelink is fairly known, they are the designer/manufacturers of many devices, often sold under another brand. I’m also not sure who is making MXP Pro, but if it is the same as MXQ S85, then it should be pretty decent. I should receive a few S905 boxes by the end of the month and December, so I’ll find out about the performance. Ugoos devices should have decent support too. More companies will launch S905 products soon, but I can’t mention them yet. I’ve been told Kodi is not quite working well on Amlogic S905. Apparently there are some other issues (which I can’t talk about, and I’ve just learned about them now), so it’s better to wait a little longer before buying an Amlogic S905 device if you want to enjoy all the features. Maybe mid December will be OK.
are the issues hw or software? One of the issues won’t be fixable after the product is shipped. But when I only use 1080p there should be no problems, right? Can you recommend best box/chip for good old 1080p AVC ? Don’t think I can wait for all those 4k chips to secure. I would be very happy to hear new information about AMLogic S912 and about devices that use it. Damn, I’ve ordered a Beelink Mini MX a few days ago. Is the isssue about that S905 doesn’t work with EMMC yet or something worse that will leave our devices without firmware updates, because of chipset problem? Or thermal throtting problem that plagued an Amlogic soc(s802 if I remember correctly)? Probably it won’t run up to 2GHz like in the specs!? Yes, Amlogic had best stable 4K HW playout, we did extensive study and went for S8xx. Problem is they want to completely lock down the box to get silly HDCP 2.2 cert. Makes it totally uninteresting as OEM product for us. We will go for first fab that provides COMPLETE open source firmware and working 10 bit HEVC. next time, it would be better to write all the details in a table, which simplifies the ability to compare the specifications of all the models. With the latest Kodi 15.2 with Zidoo patchsets, RK3368 support has significantly improved. There’s a wide range of perceptions and needs among people when it comes to video playback. While some people are happy with stereo audio and a few skipped frames, others will notice the frame dropped every X seconds when a 23.976 fps video is played at 24 Hz, and needs Dolby Atmos pass-through to work with there AV receiver. Usually, I find Amlogic video codec support and quality to be better, but Rockchip video playback is still acceptable to many people. If you just play local files, the issue won’t affect you. I’ve also been told the Dolby and DTS version of S905 SoC will ship at the end of the month. Maybe have a look at products based on Amlogic S805. MXQ S85 worked well last year when I reviewed it (http://www.cnx-software.com/2014/10/11/amlogic-s805-review-android-mxq-s85/), and it seems to be getting some firmware updates too with the last one in July… (http://freaktab.com/forum/tv-player-support/amlogic-based-tv-players/beelink-aml-devices-s82-m8-round-mxiii-etc/19234-official-stock-firmware-beelink-s805-soc-mxq-mk808-plus-mk809-plus-user-feedback?p=522398#post522398). You may want to read the comments in my review, because some people still had issues with the device. Amlogic S912 has been delayed. hmm… not sure it’s a hw issue given that there are so many boxes out there already. and @cnxsoft was very cryptical 🙂 my feeling is that it’s probably HDCP certification – currently prob there is no key, but maybe amlogic will get the certification later on (december), and start loading the keys in the newer products. I am not familiar with the process tho`, who should get the certification – amlogic or the vendors? Each company that need hdcp need to become hdcp license adopter which is 25k usd yearly and nobody from this companies will pay that money. Really looking forward to a review of the geniatech or Venz atsc products. The devil really is in the details for these devices. All I really want is something that can do 1080p decoding consistently and change channels on ATSC sources quickly, and have a decent interface to do it in. Kodi I find is way to oriented towards having a media library — which isn’t how most people watch TV, most people I imagine are like me, they watch something new most of the time and on occasion rewatch something. Kodi goes so deep in to making things pretty and having a 100% database of actors, producers, etc of each individual movie in the collection, information that is really orthogonal to most peoples interests. Forgive my ignorance, but what is HDCP needed on a media playback device? Is it required for HD/4k Netflix? Perhaps an ATSC/NTSC tuner box when in an area that does encrypted playback or premium channels? But for most of these boxes they don’t have a tuner and so why do we care about HDCP? all the current “tv boxes” run only the tablet version of netflix. they cannot run the android tv netflix version (HD/4k capable) that requires a higher level of DRM. so i think this is the issue here. I think this calls for some online poll. Are many people watching videos directly from their web browser (in Android)? Usually performance is quite poor, so using a dedicated app for streaming should offer better performance. yes, Netflix 4k need HDCP 2.2 player and HDCP 2.2 TV. That implies everyone that’s bought one has potentially bought a brick, why as a review site would you be so cagey about such an issue, are you bound by some NDA’s or threats no more review boxes from companies or something ? It’s information such as this that is the very reason people read your site (which is generally very informative btw). However, it’d be great if you could compile a league table of such boxes, maybe taking into account a manufacturer historical firmware support ? @mirror – Does this mean Zidoo now prefers the Amlogic SoC over the Rockchip? (which still seems to still have the usual video playback issues despite custom Kodi revisions). Is there a link to where we can read about upcoming model or was that just one off teaser stunt ? It’s just one contact working with Amlogic boxes told me about that particular issue, and told me before hand not to talk about it publicly. I could have just taken the easy route and kept silent, or as I did, inform people that waiting one month or so might be a good thing. I am probably in the minority, but I use the browser to stream mp4s from a VPS that grabs files automatically. My connection speed is sufficient to stream 720p (and HEVC 1080p) but it is bothersome to have to download a file entirely prior to watching it (ala torrent). I am interested in the browser performance going forward because I believe that VP9 and maybe HEVC will nullify the need for external players, but only once browser playback is sufficiently good to supplant the existing methods. Think, wouldn’t it be nice to have a native HTML5 interface that is easy to modify to your tastes rather than relying on someone taking the time to learn the arcane XML for the Kodi interface or whatever slapdash interface the Chinese boxes bother to put out? Any idea how long the S912 has been delayed ? I don’t know exactly how long S912 has been delayed, but considering nobody is showing any Amlogic S912 boxes, it must be several months away. Tronsmart Vega S95 with 2G/16G, AP6335(support 2.4G/5G, AC), Gigabit Lan, and SATA. Has anyone seen a price mention on a 2gb RAM unit yet? Especially with that release of Linux and uboot source code, these might be worth investigating closer.